Looking for some perks to provide clients at low cost but with high satisfaction? Introducing SAGE Scholars. As financial planning and wealth management become increasingly popular, advisors are increasingly experiencing a ‘crisis of differentiation’ where it’s difficult to distinguish themselves from the competition. This has not only slowed the organic growth rates of many advisory firms as it gets harder to generate referrals, but has made client retention all the more crucial to maintain the revenue of an advisory firm. A new offering for financial advisors called SAGE Scholars offers a unique way for advisors to offer a client perk that can help support retention and potentially generate referrals. These are Tuition Rewards, ‘rewards points’ that clients can accrue based on the assets under management (or potentially, the retainer fees) being paid to the advisor, as a rate of 5% per year of the AUM. That means a client with $1 million of assets with an advisor can potentially accrue a whopping 50,000 points per year, which can be used as a dollar-for-dollar discount for tuition among a list of 323 eligible colleges and universities (up to one year’s worth of free tuition) for any family member (including children, grandchildren, nieces, nephews, etc.). Many students can already earn merit-based aid and discounts from many schools, but there is little certainty about whether the discounts will really be there when the time comes. From the advisor’s perspective, then, offering Tuition Rewards can have a high perceived value for clients who wish to stay with the advisor, along with a service that can generate buzz among clients to drive additional referrals. The Tuition Rewards program from SAGE Scholars allows participants to earn “guaranteed minimum scholarships” for family members (e.g., children, grandchildren, etc.) at 300+ participating private colleges in 45 states. The scholarships function as discounts off the list price of the college’s tuition, up to a maximum of one year of free tuition for a students. The points are not liquid, have no cash value and do not have to be honored at any institutions outside of the member colleges themselves. SAGE (short for “Savings And Growth for Education”) Scholars was formed in 1995 to help improve the affordability of private higher education. The program was created by Dr. James Johnston, a former director of Aadmissions and financial aid at the Wharton School at the University of Pennsylvania. After 19 years of growing the program, there are now almost 300,000 students nationwide enrolled in Tuition Rewards, including a large contingent as part of the Pennsylvania 529 plan. According to SAGE’s data, in 2013 participating students used reward points valued at $33 million with 3,118 applications to member colleges. The number of colleges honoring Tuition Rewards continues to increase as well, from barely over 200 six years ago to 323 colleges and universities today. Because Tuition Reward points can be used for multiple family members, even clients with larger account balances who may reach the single student maximum quickly (with a $1,000,000 account balance, Tuition Rewards accrue at a rate of $50,000/year! ), may find value in continuing to accrue points that can be distributed to any family members (SAGE allows a rather broad family list, including siblings, children, grandchildren, nieces, nephews, aunts, uncles, and cousins). Over the span of just five years, a $1 million account balance can rack up points worth a whopping $250,000 of Tuition Rewards to “hand out” to a wide range of family members. The benefits are not taxable, as Tuition Rewards are treated as a discount to tuition itself, not a liquid/cash benefit. So how would the Tuition Rewards program work for an advisor in real life? Advisors pay to have access to Tuition Rewards and to be able to enroll clients in the program and generate reward points on their behalf. The cost to an advisor to participate is $74.95/month; paid annually, with a one-month discount, it’s only $824.45/year (discounts are also available for firms with multiple advisors). Clients are not charged at all, and there is no per-client cost to advisors (the flat $75/month fee is intended to cover up to the “normal” amount of clients a typical advisor may have). Upon joining, advisors receive a login area on the SAGE Scholars website to manage their clients, where they can enroll individual clients who choose to participate. Initial client information is entered into the system, which generates a welcome email to the client, who can then go to the Tuition Rewards website and log in to activate their account. Once activated, clients can use their account to monitor their rewards balance, add students to their account, transfer points to students and submit points to colleges on behalf of students at the time of college application. Once signed up, the advisor provides information on client account balances twice a year (January and July), so that clients receive their points at a rate of 2.5% twice a year (based on December 31 and June 30 end-of-period balances, respectively) to get their total 5% points accrual. Once clients are set up, SAGE assigns client with ID numbers so that names don’t need to be transmitted on an ongoing basis, to help support client privacy. Over time, Tuition Rewards points accrue for the clients, which they can monitor, track and assign to student family members through the website as noted earlier. Ultimately, clients are the participants in the program (termed ‘Sponsors’ of Tuition Rewards under SAGE). Thus, advisors have no legal obligation to fulfill the tuition discounts under the SAGE Scholars program. Advisors are merely providing clients with access to participate in the program, and accrue points based on the business they do with their advisor. Clients who enroll don’t even need to name their students now, in case they aren’t sure, or there isn’t an appropriate student to name yet (e.g., the grandchildren haven’t been born yet!). However, for a student to be eligible, they do ultimately need to be identified by the sponsor to SAGE by August 31st of the year the student begins 11th grade. This is because enrolling the student in the program grants permission to the eligible universities to send the student information about the university (this ability to “market” to students is one of the value propositions for the educational institutions), and the schools want some time to send information about the school before it’s time for the student to choose a school! For students who are signed up earlier, the institutions cannot begin to send any college information to the student until he/she reaches 9th grade. A client sponsor can identify multiple students over time to be eligible for Tuition Rewards (and receive information from the eligible colleges and universities). In addition to identifying students under the program by August 31st of the year the student reaches 11th grade, Tuition Rewards points must be transferred from the client sponsor to an actual account of the student by August 31st of the year that 12th grade begins for that student. At that point, the student can no longer receive/generate any additional points (though the sponsor can continue to accrue more/new points to transfer to other students in the future). This creates an effective deadline, beyond which students can no longer get Tuition Rewards points. If a student doesn’t attend a member college, the sponsor can transfer points back to the sponsor’s account, or over to another eligible family member (e.g., the next-oldest student in the family); otherwise, the points transferred to that student expire after three years. To the extent the client sponsor has (or continues to accrue) more points, they can still be transferred to other students who have not yet reached the deadline age threshold (and points in the original sponsor’s account never expire). Redemption of Tuition Rewards is limited to undergraduate education (not graduate school), beginning with the freshman year. 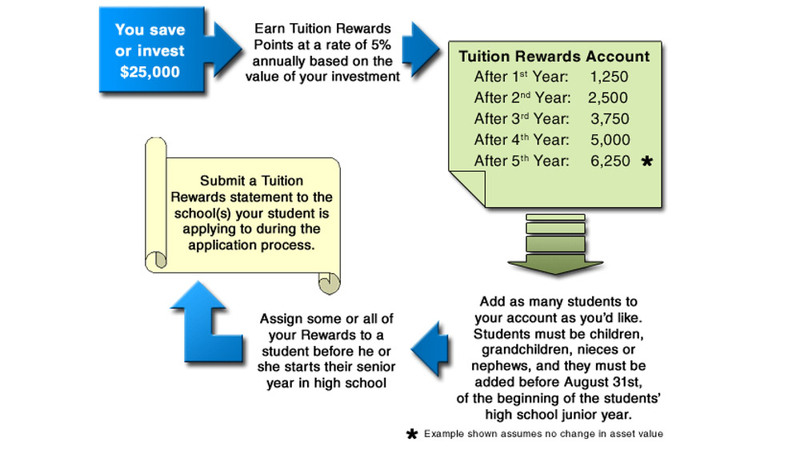 Tuition Rewards must generally be redeemed ratably over four years, which means even earning the “maximum” of 1 year of tuition will actually result in a redemption of 1/4th of tuition per year for four years; in practice, this leads to a “maximum” annual reward over $10,000/year, as there are currently 14 schools in the SAGE Scholars network with annual tuition in excess of $40,000/year. Tuition Rewards points must be declared to the college at the time of application, to ensure that the institution appropriately assigns the proper tuition discount for the available points for redemption (and so that total merit aid is calculated appropriately). Check out the SAGE Scholars website for further details on how the program works, and also their listing of answers to additional Frequently Asked Questions (FAQ). Be certain to understand (and explain to clients) the three key timing deadlines for Tuition Rewards: 1) when to add students to the sponsor’s account; 2) when to transfer Tuition Rewards from the sponsor to the student’s account; and 3) when to submit the Tuition Rewards points to the school. The basic idea of offering Tuition Rewards in an advisory firm is relatively straightforward: it can be an incredibly appealing client perks program, with the ultimate goal of helping to attract and retain clients. From the sheer dollars and cents perspective, the leverage of Tuition Rewards is significant; for an advisor cost of less than $900/year, clients can rapidly accumulate significant Tuition Rewards at a rate of 5%/year of the account balance. At the typical wealth levels and account balances that advisors on an AUM model maintain with clients, Tuition Rewards points could realistically accumulate at the pace of thousands or even tens of thousands of dollars per year. And because of the broad latitude of family members to which points can be granted, a senior member of a family (e.g., a retired couple) can potentially assign points down to a wide range of grandchildren, nieces, and nephews (or for younger clients, to use with their own children directly) as points continue to accrue over time. Merely getting—or retaining—one client per year who pays $5,000 of fees recovers the entire cost of the entire program and then some (by a factor of five)!. And as practice management consultant Angie Herbers has recently written, advisors often underestimate the power of “client perks” in generating referrals as well. Of course, making the Tuition Rewards program available to clients will require a disclosure of the details to clients, including that the student’s information will be provided to the educational institutions, and an explanation of the potential conflict of interest (SAGE Scholars has obtained an opinion letter from compliance attorney Tom Giachetti of Stark & Stark affirming that the program can be offered by RIAs to clients with appropriate disclosures). Advisors using a broker-dealer will need the compliance department to accept participation in offering Tuition Rewards to clients as an Outside Business Activity (OBA). For clients that leave, the recommended treatment (both from SAGE Scholars, and for compliance purposes) is that points that clients have earned are not forfeited, but are merely frozen at current levels, and can no longer be accrued further. In addition, it’s worth remembering that the points have no liquid or cash-redeemable value (which avoids them being deemed as rebating for compliance purposes), cannot be transferred (except as specifically permitted to student family members under the program) and in many cases may simply replicate the tuition discounts that students may already have been able to receive anyway. In addition, the eligible institutions on the SAGE Scholars list are generally not so-called top tier schools (which generally don’t feel the need to offer discounts to attract students). Of course, despite aspirations, not all students are realistically going to go to such schools, either. Thus, notwithstanding that Tuition Rewards may potentially be discounts that could be obtained anyway, and may not be to top tier schools, there’s arguably still a lot of perceived value in having that tuition discount guaranteed under Tuition Rewards, for at least some schools, rather than simply hope that the discounts are available when the time comes. It’s still always possible that students will get additional merit aid on their own anyway; Tuition Rewards simply represent the minimum that the schools are agreeing to provide (though again, Tuition Rewards must be reported to the school at the time of application so that merit aid packages, including Tuition Rewards and any other benefits, can be determined appropriately).